Owning a pair of studio monitors goes a long way to enhance your studio experience and augment your musical career. But we cannot disagree that it is an expensive investment that needs careful consideration and planning. Just buying the first studio monitor you get your hands on will not do and that is why we have chosen to compare and review two studio monitors that have accumulated quite a fan following. Yamaha HS5 and JBL LSR305 are two of the most popular studio monitors that have been dominating the market for some time now. Here is our in-depth review and comparison to decide whether they are worth the investment or not. The JBL LSR305 is an exceptionally stylish and glossy studio monitor that is bound to leave you breathless. Sleek jet-black plastic lines, a glossy circle surrounding the drivers, and very Batman-like features around the tweeters make it one of the best-looking monitors in the market. While the Yamaha HS5 is decent enough, it offers nothing special in terms of design. It is a simple, traditional studio monitor. With JBL LSR305, you get the exact right amount of connection points that offer better functionality without making it too complex or daunting. The studio monitors showcase simple build that is easy to understand and convenient to use. The Yamaha HS5 offers a minimalist design that is quite similar to the JBL one. It is easy to use and can be a great choice for beginners as well as the experienced crowd. Both the studio monitors show exceptional quality when it comes to the monitor itself. The cables with the LSR305 are decent enough. However, the cable that comes with the Yamaha HS5 is of extremely low quality and does not seem to have a long lifeline. But, the cables are easily available and can be replaced. The JBL LSR305 avails an amazing and versatile sound quality that most enthusiasts will absolutely love. The incredible detail from the bass to the high end makes the sound impressively flat and neutral. The studio monitor shows startling clarity and lets you hear even the subtlest nuances of any music. There is a touch of warmth that makes music more entertaining and enjoyable. One of the best things about this monitor is its control over the highs. Even if you play the music at the maximum volume, the clarity and accuracy remain the same. 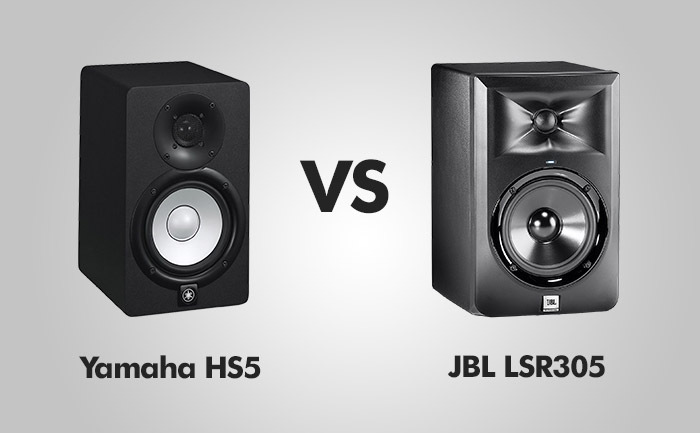 When it comes to Yamaha HS5, we found the sound quality a bit lacking compared to the JBL one. While the sound is flat and neutral, it is not as clean as the LSR305. The bass and the highs are phenomenal but the mids have their issues. One of the things that we loved about HS5 was that it translates exceptionally well. All you need to do is mix the sound well and the studio monitor will translate it to other sources in top-notch quality. The highs are one of the best points and the bass is great too. Once you are done with the initial mix-down, not much change is required which is great. But if you are looking for a punch, Yamaha might be too weak for you. When it comes to the genres they play best, JBL LSR305 works exceptionally well with just about any genre. As it is quite flat and accurate, you can easily enjoy any music, be it hip-hop, classical, rock, or more. The tight and punchy low and a crystal-clear treble make this monitor a favorite amongst hip-hop enthusiasts and bass heads. The Yamaha HS5 is great for critical listening and acoustic performances. Keyboards, chamber music, and guitar performance will definitely work wonderfully on these studio monitors. But if you want to work with hip-hop and want something a bit more bass-centric, you might want to give this a miss. The bass is not that great and very hard to mix. For such needs, it is best to stick with LSR305. PROS: Neutral, flat sound / Clean highs / Translates remarkably well to other sources / Great for critical listening / Doesn’t need much change after initial mix-down. PROS: Extraordinary looks / Easy and functional / Clear and accurate sound / Great highs, mids, and lows / Plays great for all genres. CONS: Not as punchy / Mid-range is lacking / Not as versatile. CONS: The material around the tweeter seems a little fragile / Need more space. Both the studio monitors are great for the price they are being offered at. If you want something a bit more versatile, enjoyable, and accurate, go for JBL LSR305. But if you want a monitor that is more clear and critical, Yamaha HS5 is what you need. Choose the monitor that best fits your needs and enjoy the results of your investment.